For those of you who regularly read GGMH you will know that I like to mess about with my hair and I have no qualms about how many litres of dye I slap on my scalp. Since having to have a good two inches off the ends of my hair I am trying to pack in the dye and try other lightening methods. This little number is a gradual hair lightener that fits snuggly into your everyday hair routine. To use the spray you firstly wash, condition and towel dry your locks before spraying the coconut scented product into your hair and brushing through the strands for an even coverage. The formula works when you apply heat from your hairdryer with each coated strand gradually lightening. 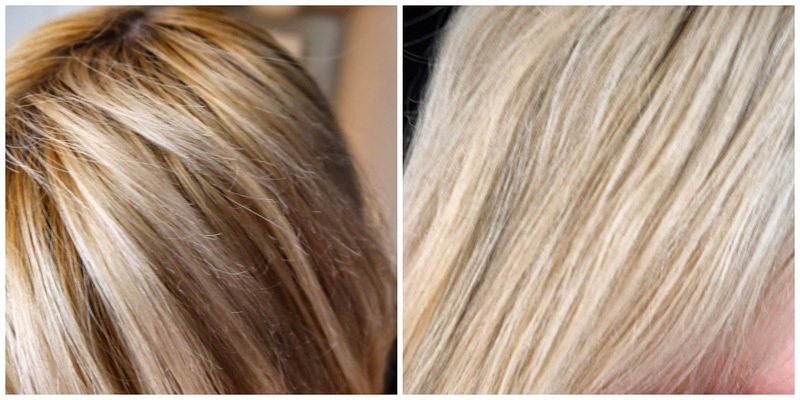 The product also continues to lighten your hair every time your heat is exposed after the initial application. Now, I might add that you are essentially spraying hydrogen peroxide onto your hair so I can't say that this isn't completely damaging and I would imagine that continued use would cause as much damage as hair dye would however, I have found that this stuff is amazing for naturally dark haired girls like myself whos roots are a little more orangey than the rest of their hair. I spray a generous amount of product onto my roots and I have found that they are much more blended. Using this stuff on already light blonde hair sends it into the platinum stratosphere although Mellor and Russell don't recommend to use this on super bleached hair. I think this product is great for anybody wanting to lighten their hair for summer or add subtle highlights to their hair in the way the sun naturally would. Have you ever tried a lightening spray?